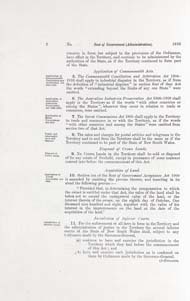 This document provided a legal framework for the new territory, and a body of law based on New South Wales laws. 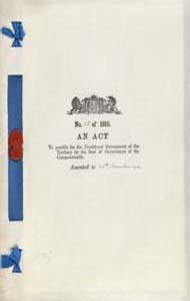 This included Acts of the New South Wales Parliament up until 1911, and Acts of the British Parliament. 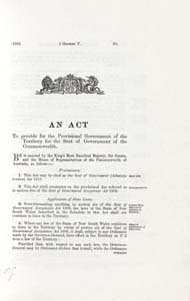 This Act provided that from 1911, new laws would derive from Ordinances made by the Governor-General and Acts of the Commonwealth Parliament. It remained the constitutional basis for law-making in the Territory for nearly 90 years, until the ACT (Self-Government) Act 1988. The Federal Capital Territory had no court system of its own and jurisdiction of the New South Wales Supreme Court was granted to the High Court to administer justice in the new Territory. For other matters, Section 11 of the Act provides that the jurisdiction of other New South Wales courts such as the Court of Petty Sessions would continue after the establishment of the Federal Capital Territory the following year. Section 9 of the Act provides that no land in the Territory can be held by freehold, establishing the leasehold system that continues today. The ACT is the only self-governing territory in Australia established under a system of leasehold. When Charles Scrivener’s team of surveyors and draftsmen began the survey of the Federal Capital Territory, parliamentary draftsmen were also busy drawing up a comprehensive Bill to provide for the necessary machinery of government. The federal government took over both the Northern Territory and the Federal Capital Territory on 1 January 1911. Arrangements for transferring the Northern Territory from South Australia provided some precedents. Neither Territory was provided with a legislature, with the federal parliament authorised to make laws for each, and the Governor-General in Council to make ordinances. But while the Northern Territory was provided with a Supreme Court from the start, the Seat of Government (Administration) Act 1910 excluded a court system. The first Federal Capital Territory Ordinance, in September 1910, provided that the authority of New South Wales lower courts extended to the Territory, across the borders then being drawn up. The previous jurisdiction of the Supreme Court of New South Wales was conferred on the High Court. 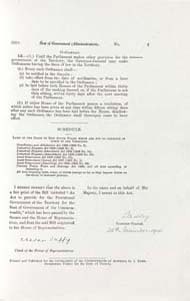 The principle of a leasehold land tenure system for the seat of government had been raised by Edmund Barton in January 1901 to limit speculation and ensure increasing values contributed to the cost of a federal capital territory. The present system of 99-year leases was introduced when the first blocks were auctioned in December 1924. The official foundation of Canberra was eleven years before, at a ceremony on 12 March 1913, now celebrated as Canberra Day. Atkins, Ruth, The Government of the Australian Capital Territory, University of Queensland Press, St Lucis, 1978. Gibbney, Jim, Canberra 1913–1953, Australian Government Printing Service, Canberra, 1988. Medium: Parchment and paper, bound with blue silk ribbon, red wax seal. Features: The ceremonial elements – the ribbon, seal, and Royal Arms on the front cover, and the Assent signature of the Governor-General Lord Dudley on the third page.